Mission: Impossible – Ghost Protocol is now available streaming on Netflix. The 2011 Mission Impossible movie stars Tom Cruise, Paula Patton, Simon Pegg, and Jeremy Renner. It was released on Netflix over the weekend. 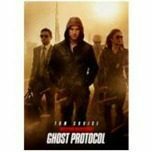 Ghost Protocol is the fourth sequel in the Tom Cruise Mission Impossible series. While many film series are pretty stale by the time they get to the third and fourth sequels, Mission: Impossible – Ghost Protocol has held up pretty well. Reviewers on Netflix currently have the movie ranked 4.1 out of 5 stars. At Rotten Tomatoes, it’s rated 94% on the Tomatometer and 85% of regular viewers “liked” it. Netflix appears to be working on its image – providing more up-to-date movies rather than the older, rather stale, movies it has offered via streaming in the past. It’s taking some time though. In December Netflix announced a new agreement that will allow it to stream movies from The Walt Disney Company, Pixar and Marvel – but that agreement won’t actually result in streaming Disney movies until 2016. Netflix has also begun producing its own content. Their new series, House of Cards, is set for a February 1 premiere – and Netflix will be putting the entire first season (13 episodes) online at once. “Netflix is giving viewers complete control over how and when they watch the show,” said Ted Sarandos is Chief Content Officer for Netflix, when the first trailer for the series was introduced. Other recently released movies on Netflix streaming include Butter (2011) and Star Trek: Nemesis (2002). Dr. Seuss’ The Lorax was scheduled to appear on streaming yesterday, but in our latest check it was only available on DVD, not instant streaming. We have asked Netflix about this and will provide an update when they answer.